In honor of world card making day Oct. 1st I will be hosting an open house card buffet. These are some of the cards you can make. There are 12 in all and you can choose to make one or all of them. Cost is $2.00 each, or all 12 for $20.00. With a $50 order you get 4 free. If you live in the Orange County, CA area please leave a comment if you wish to attend and I will let you know the address. Also, don’t forget the Paper Pumpkin special. For first time subscribers, order the October kit by the 10th of the month and get the November kit free. This is a great time to try Paper Pumpkin. Also don’t forget all the great items in the holiday catalog and the 2016-17 annual catalog. Check out all the items in my online store at http://darleneseitz.stampinup.net. go to mypaperpumpkin.com and use demo code 2096764 and bogo in the promo code. Floral Boutique, Moroccan, Fruit Stand, Blooms & Bliss, Festive Birthday, By the Shore, Presents & Pinecones, and Candy Cane Lane. I will be running my own share deal on the Presents & Pinecones. One pack EXCLUDING the diagonal strips sheets (2) for $8.00 plus shipping $4 (if necessary). That’s 10 12×12 double sided sheets. In other news, the stamp set Thoughtful Branches is still available while supplies last. See my prior blog posts on this set for more details. Aren’t these adorable! They can be made with a sweater or a stretchy shirt. These were made from the sleeve. You can make two to three pumpkins from one sleeve. From the middle of the shirt you can make one big pumpkin. Cut the sleeve into two or three pieces. Sew the bottom with a gather stitch and gather, turn inside out to do this. Do the same at the top opening and gather but leave a hole at the top to stuff it. Stuff and pull all the way tight and then sew down the middle so the top indents some. Hot glue a stick in the middle, add some buttons and a bow with rope or whatever you want. Thanks to Debbie Martin for showing us how to do this today. HALLOWEEN CARDS MADE WITH PRODUCTS FROM THE 2016 HOLIDAY CATALOG. 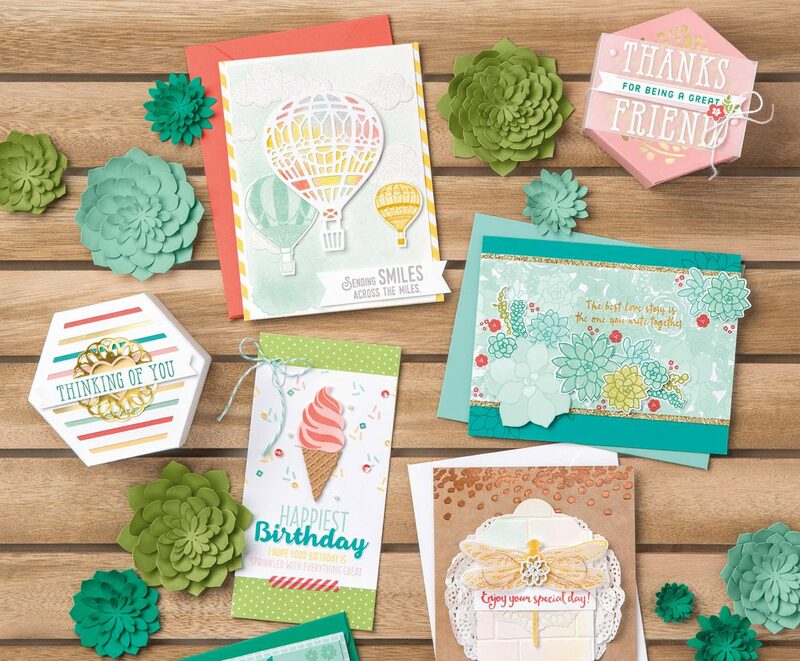 These cards were made from products from the new StampinUp Holiday catalog for 2016. The first one is a peek-a-boo card. When you open it, the greeting slides up to the opening (oval). The DSPaper and the string are from the catalog. The mummy card is a shaker card. This halloween stamp set, called Cookie Cutter Halloween is adorable and pairs with the Cookie Cutter Christmas stamp set that has a matching punch with it. You can also use the punch to punch out four adorable figures that come in the Halloween set. The stamp set, the paper and the string all come from the Holiday catalog. The third card uses an embossing folder that looks like a sweater and gives a 3D effect to the card. The stamp is called Halloween Treat and the Designer Series Paper and the black and orange paper also come from the catalog. There are many more items that are just as cute in the Holiday Catalog. If you don’t have a catalog yet and would like one (and you don’t already have a demonstrator), just leave a comment on this post and I will get one to you. You can also email me at darstz@hotmail.com. To see the catalog online and to shop in my store, go to http://darleneseitz.stampinup.net. SPECIAL OFFERS: Every week till the 21st, Stampin Up will be having special offers on certain products which are 25% off. See my online store or contact me for information regarding the items on special. PAPER PUMPKIN: For first time subscribers, Stampin Up is offering a buy one get one free for their monthly craft kit. The kit comes with every thing you need except scissors, yep that means stamps and ink too. They even give you a block for your stamps in the first month’s kit. You can make all of the intended project or some and save some materials to create your own, like cards. If you subscribe with me you will receive extra supplies to make some alternative cards. Sign up by September 10th to take advantage of this offer. That’s $40 value for only $20. If you have been thinking of trying Paper Pumpkin, now is the time. Contact me to get signed up. Get started on your Holiday Crafts and take advantage of these special offers and deals..